Reservations for priority presales open at Spire Condiminiums two weeks ahead of sales debut. Executives of Laconia Development and Realogics Sotheby’s International Realty (RSIR) announce the commencement of individual unit reservations at SPIRE – a new 347-unit, 41-story high-rise now under construction at 600 Wall Street in Belltown. Following a preview open house on October 13 and 14, the SPIRE sales team accepted 114 first position reservations along with one dozen second position and several third position commitments on popular floor plans. Reservation activity has recorded more than $125 million in potential presales ahead of SPIRE’s official launch planned for late October 2018. A temporary “pop-up” preview center has been installed in the offices of RSIR located at 2609 1st Avenue in Belltown and remains open daily from 11:00 a.m. to 6:00 p.m. (or by appointment). Unit reservations provide homebuyers with a first right of opportunity to purchase a specific home within a set price range in exchange for a $5,000 fully-refundable deposit held in escrow. The developer will then make an offer to sell to the reservation holder and the reservation and pre-sale process will resolve buyer concerns of competitive offers or price increases. Menzies confirms that the 5,000-sq. ft. sales center is being constructed at 2218 5th Avenue in Belltown complete with a full-scale model home, a design center, a 9-foot scale model of the tower, a context model of the neighborhood and immersive virtual reality experiences to help convey the final product offering. A sample collection of unit listings is posted to the NWMLS with an offer review date scheduled for October 31, 2018. This date follows the grand opening of the SPIRE sales center and a public sales event scheduled for October 27. Jones notes a quarter of the reserved homes at SPIRE are at values greater than $1 million drawing downsizing empty-nesters and move up buyers to the voluminous interiors, premium finishes and expansive views. The presale demand tracks with an uptick in luxury resales over the past two years as affluent consumers increasingly move into downtown Seattle. For the first three quarters of 2018, the volume of resale condominiums sold above $1 million increased by 44 percent to 84 units compared with the same period in 2016, according to NWMLS records. That doesn’t include new construction presales like NEXUS Condominiums that are incubating more than 100 units priced at more than $1 million (94 percent of 389 homes at NEXUS are presold but not yet closed). Designed by VIA Architecture, SPIRE is a tall and slender tower with generous ceiling heights ranging from 9 feet on levels 4 through 23 and rising to 9 feet six-inches above level 24 with the top two penthouse levels at 10 feet. 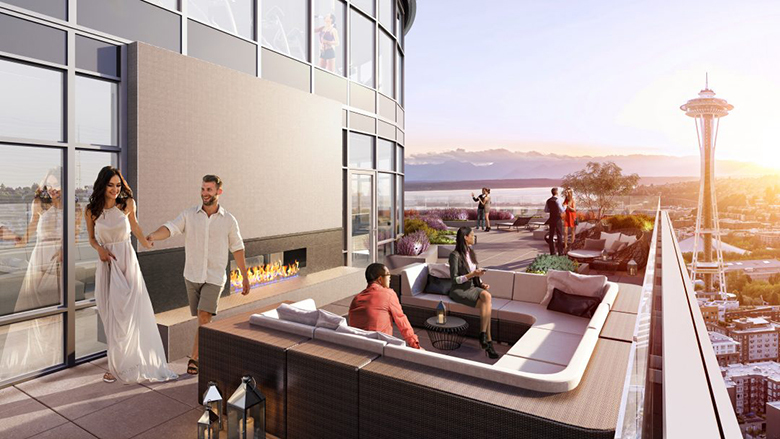 Located on the northernmost development lot on 6th Avenue within Belltown’s high-rise zoning, the maximum building heights across Denny Way drop to just 85 feet affording dramatic vistas of the Space Needle, Elliott Bay and Lake Union. Meanwhile the building’s triangular shape and full-block composition opens up view corridors and enviable tower spacing from adjacent properties unlike other developments that are getting boxed in by a meteoric construction boom in downtown Seattle. Reservations were made available on one-, two- and three-bedroom floor plans ranging from 531 sq. ft. to 1,825 sq. ft. with introductory pricing offered from below $500,000 to more than $3.5 million. Laconia is also exploring the possibility of assembling penthouse floor plans in excess of $5 million for 2,600 sq. ft. or more. Curated by Robin Chell Design, the inspired interiors feature engineered oak hardwood flooring throughout the primary living areas and kitchens with Italian Pedini™ cabinets, quartz countertops, Bosch™ appliances with gas cooking. Other home features include spa-like bathrooms, 7- or 8-foot solid core doors and a host of high-tech options and upgrades. Homebuyers may choose between to designer color schemes. New details about SPIRE’s robust collection of amenities and resident services were also released. The street level will host a two-story lobby with concierge services and a garage entrance that leads to three unique auto ports to access Seattle’s first smart automated parking system, manufactured by Sotefin™. Third-floor amenities include a co-working lounge, a gaming studio, a Skype room, a conference room, and a studio for yoga and spin classes. Above it all is the SPIRE Club — a two-level amenity facility that includes an exhibition kitchen and private dining area; a games room and bar; an art gallery; exterior terraces with barbecues, fire pits and entertaining spaces; and a fully appointed fitness facility with cardio and weight training equipment. “Presales are proving to be popular because they provide buyers plenty of time to sell an existing home into a rising market while the building is constructed over the next two years,” said Michael Cannon, Senior Sales Director for SPIRE and a broker with RSIR. “Just a five percent earnest money deposit is required with opportunities for interest rate locks before closing,” he adds. For more information on SPIRE Condominiums, visit the website here.